Remember the post a few weeks back showing the snail shells in the harvester ant midden? Let’s take a little closer look at what kinds of objects harvester ants collect and put on their mounds. 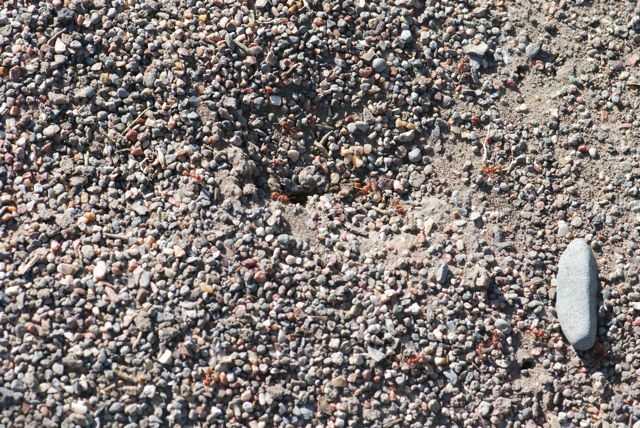 At first glance a harvester ant mound looks a bit like a pile of rubble. If you start to study the mound, however, you begin to notice that the pebbles are roughly the same size. Harvester ants (Genus Pogonomyrmex) are known to gather various objects and deposit them around their nest entrances. 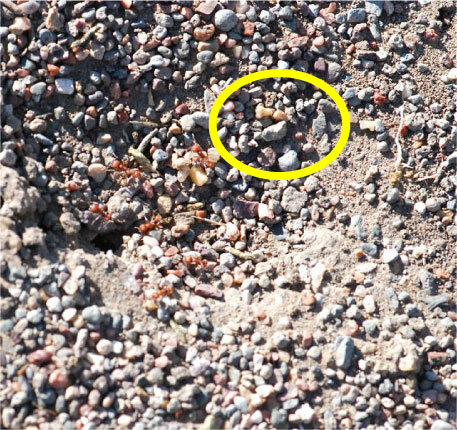 Harvester ants in the western United States often gather pebbles, among other things. if you are interested in harvester ants, you should pick up the fascinating article by Daniel Adams in Smithsonian Magazine from 1984. Adams described how paleontologist John Hatcher discovered a terrific place to find tiny fossils, such as the teeth of mouse-sized mammals. In fact he went from finding an average of 2 per day to over 87 per day. What was his secret? Hatcher discovered that harvester ants pick up ant-sized fossils and drop them on their mounds. Hatcher simply had the locate ant mounds and sort through the piles. Much of what is known about the mammals that lived during the time of dinosaurs is due to the diligent collecting behavior of harvester ants. Paleontologists and archaeologists both still use mounds as a source of tiny fossils today. The University of Colorado Museum of Natural History has an exhibit honoring the contribution of the western harvester ant (Pogonomyrmex occidentalis), called Tiny Collectors: Harvester Ants. This page has a photograph of a mound and more information about how the fossils are collected. Most of the finds are in Montana, the Dakotas, Wyoming, and Colorado. I’m not sure, but there might even be something in the mound from Arizona. Can you spot it in the upper right hand corner? To me it looks a bit like a tooth. In 2009, Schoville et al. distributed beads of various sizes and colors around harvester ant mounds at measured distances to investigate how far harvester ants move artificial material. They found ants would bring back beads from as far as 48 m away, but most were collected within 20 m of the main entrance. They were interested in how harvester ants moving artifacts potentially effects archaeological findings. Deborah Gordon first studied deposits of charcoal in Pogonomyrmex badius middens in 1984. She established that the pieces of charcoal were not incidental, because if she removed the charcoal bits, the ants quickly began replacing them. She concluded that the charcoal probably marked the ants’ territories and deterred other ants. Smith and Tschinkel re-visited what they called “non-food collection” by harvester ants. They evaluated mounds in Florida and found that pieces of charcoal were the most common objects, as Gordon had. They suggested that the objects reflect a significant amount of material, and that once again, the collecting behavior probably isn’t incidental. 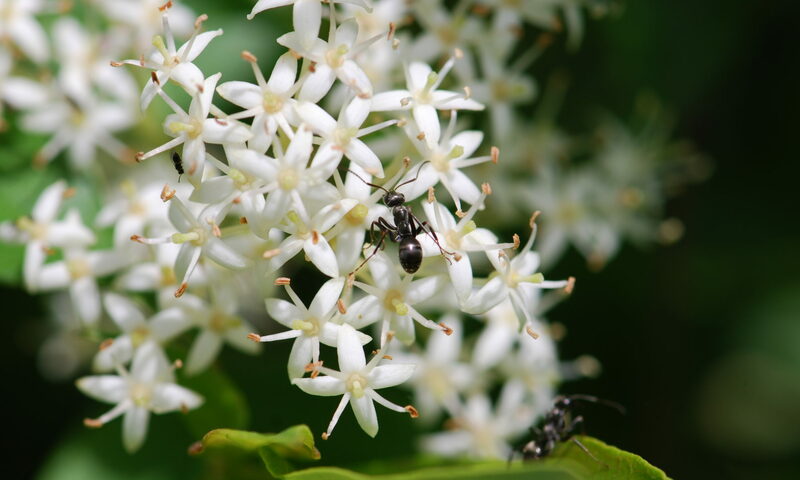 They found a slight increase in temperature in mounds with charcoal versus those without, but found no evidence other ant species avoided the pieces. It turns out that other people have also noticed snail shells on harvester ant mounds. PÁLL-GERGELY and SÓLYMOS are malacologists working in Turkey who found that harvester ant mounds can be a significant source of taxonomic material, especially for more cryptic species of snails. They noted that the ants tended to collect the smaller species of snails, and the juveniles of larger species. They did not observe the ants feeding on snails, but noticed some shells were cleaned out and some were not. They emphasized that harvest ants are known to collect and feed on seeds. Some ants do eat snails. Mark Moffett has a photo of a Basiceros singularis worker feeding a tiny snail to its larvae. (You might have to scroll through a few photos to find it.) Do harvester ants do the same? The bottom line is that harvester ants have some interesting and unusual things on their mounds, and as of yet, we don’t have a very clear picture exactly why or how. In any case, we humans have found ways to use their activities to our benefit. What unusual items have you found on a harvester ant mound? small bones. Smithsonian, 15: 99-104. Gordon, D. M. (1984), The harvester ant (Pogonomyrmex badius) midden: refuse or boundary? Ecological Entomology, 9: 403–412. PÁLL-GERGELY, B. and P. SÓLYMOS. (2009). 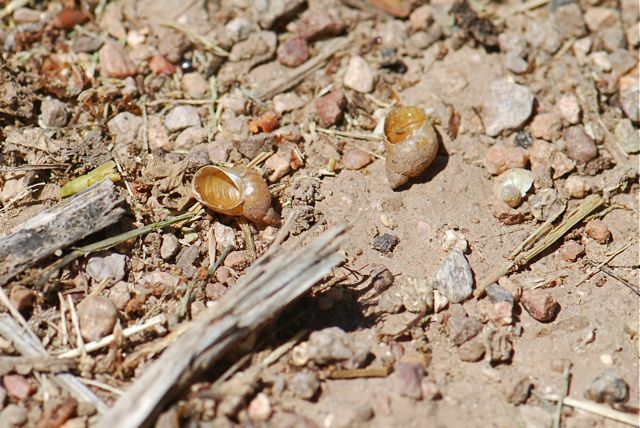 Ants as shell collectors: notes on land snail shells found around ant nests. Malacologica Bohemoslovaca, 8: 14–18. Schoville, B. J. Burris, L. E. and L. C. Todd. (2009). Experimental Artifact Transport by Harvester Ants (Pogonomyrmex sp. ): Implications for Patterns in the Archaeological Record Journal of Taphonomy, 7 (4): 285-303. Smith C. R. and W. R. Tschinkel. (2005). Object Depots in the Genus Pogonomyrmex: Exploring the “Who,” What, When, and Where. Journal of Insect Behavior, 18 (6): 859-879. Florida harvester ant, Pogonomyrmex badius. Ecological Entomology, 32: 105–112. I don’t have any Harvester Ants to watch here in Southern Ohio, but I’ve seen some interesting things acccumulate on the hills of Mound Builder Ants, Formica exsectoides. 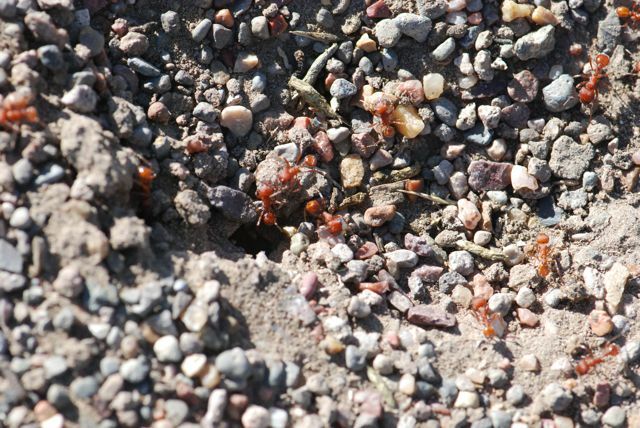 The ants always seem to be moving bits of plant or tiny limestone crumbles on or off of the mounds. The most common plant material is dead cedar leaves that are sometimes placed in a thick layer on the mound or piled nearby to form temporary quarters. I’ll have to look more closely to see what else they may have placed in the mound. Oh yes, Formica bring material to their mounds as well, including bits of resin. Keep us informed. I’ve been observing ants over the last several months, my attention grabbed by the large mounds and/or large ants. I started out looking for harvester ants because I really wanted to see a horny toad. 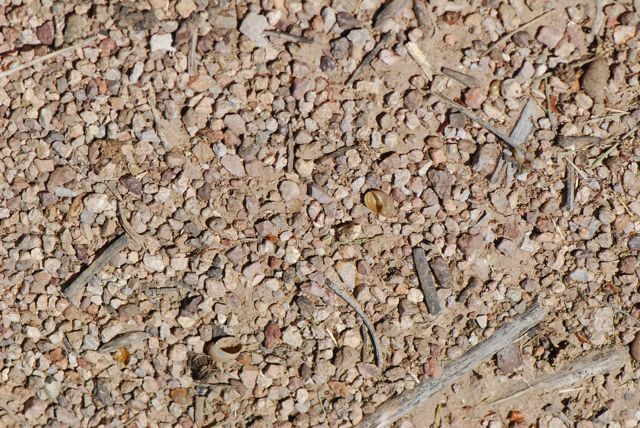 I’ve not found a horny toad yet, but I’ve become interested in the ants. I’m looking forward to learning more about them…and now, looking closely at pictures of the mounds to see what may be there. Great post! I’m looking forward to seeing what you come up with. I probably shouldn’t admit this, but I disturb harvester ant mounds as I meander through expansive habitat looking for tiger beetles to mark whether I’ve already passed by or not. I can claim it’s in the interest of efficient science – still, the 12 year old boy in me gets a bit of a delight in seeing them all coming boiling out of the nest when I first disturb it. Any ideas on why the mounds I see have all the litter on the west side? Two ideas spring to mind. 1. There’s a competing ant colony on the west side. 2. There is some sort of environmental variable, such as wind, water, or temperature gradients that they are responding to.